As chemistry teachers plan activities for their students, AACT will highlight resources from our high school library that help to reinforce topics in different units throughout the school year. In our last news post we looked at resources that focused on stoichiometry. Now we are moving on to lessons and activities that can be used to support a unit plan for teaching the gas laws. This includes exploring the relationship between pressure, temperature, volume, and moles of gas both conceptually and mathematically. Introduce this unit to your students by showing them the Gases animation which allows students to visualize how volume, pressure, temperature, and quantity of a gas are related. 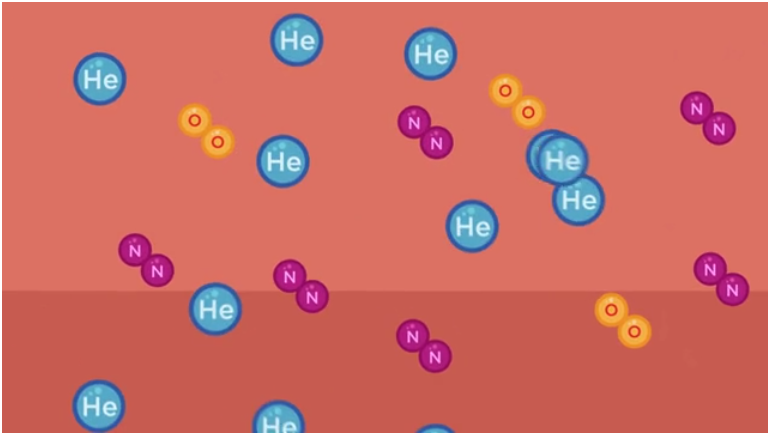 Use the animation to guide your students through a discussion of what is happening at the atomic levels for gases. You can also show the Founders of Chemistry: Robert Boyle video which tells the story of Robert Boyle, a great chemist and discoverer of Boyle’s Law, and it describes the relationship between pressure and volume of a gas. After the class discussion, students can get active with the Gas Pressure lab. By mimicking molecular motion of gases, students will better understand what causes pressure in a container and the variables that affect pressure. 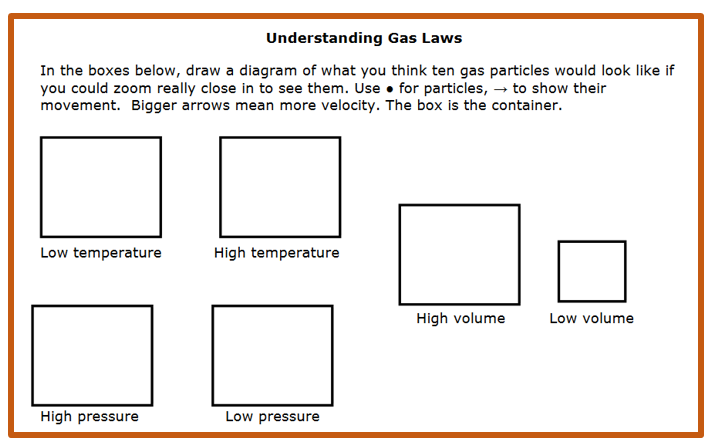 This activity will further help your students visualize the behavior of gas particles. 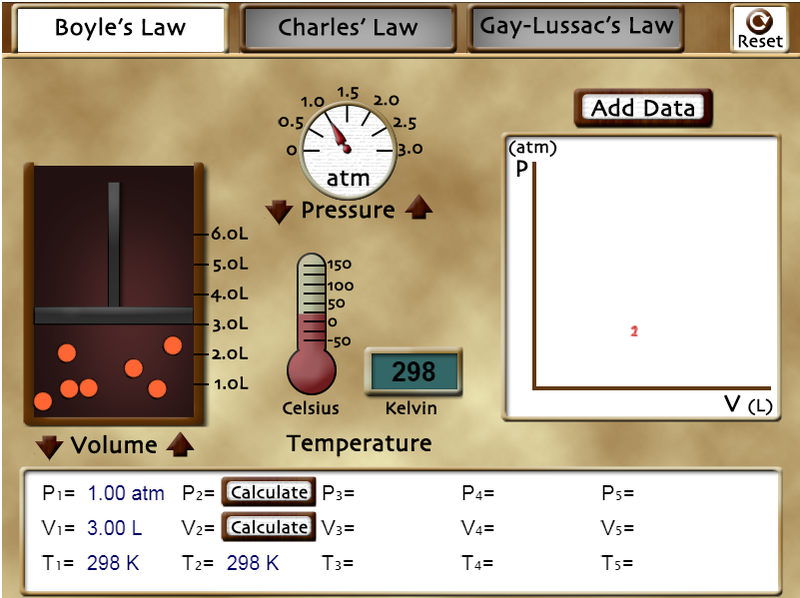 Use the Gas Laws simulation to introduce gas law mathematical relationships into the unit. In this simulation, students will investigate three of the fundamental gas laws, including Boyle’s Law, Charles’ Law and Gay-Lussac’s Law. Students will have the opportunity to visually examine the effect of changing the associated variables of pressure, volume, or temperature in each situation. Also, students will analyze the gas samples at the particle level as well as manipulate quantitative data in each scenario. Finally, students will interpret trends in the data by examining the graph associated with each of the gas laws. This lesson accompanies the simulation from the November 2015 issue of Chemistry Solutions. A “Day of Demos” will help your students apply the concepts to phenomena they observe every day. Make the Water Rise! - Students will observe the impact of temperature change on a gas through an engaging demonstration using simple household materials. Balloon and Flask– Students will witness the relationship between temperature and volume as well as temperature and pressure. Comparing Gas Density – Students will observe a reaction between baking soda and vinegar in the presence of a variety of different heights of lit candles. The initial environment has plenty of oxygen present in order to sustain the candle’s flame; however, the reaction will produce carbon dioxide which will cause the lit candles to extinguish in order of height. Students will analyze and compare the presence of the gases in the container and make determinations about the densities of each. EGG-citing Gas Laws! - Students will observe the impact of temperature change on gas pressure through an engaging demonstration using simple household materials. It’s time for some hands on experience with the Exploring Gases lab, which allows students to investigate the relationship between the variables of temperature, volume and pressure. They will engage in three lab station activities that each demonstrate a particular gas law and then interpret the results, graph data points and relate given data sets to each of the three gas laws. For a culminating activity use the Air Bag Stoichiometry project. In this activity, students make real-world connections of stoichiometry with the design of car air bag. This can be used as a class activity or as an assessment. We hope that these activities can help you to reinforce several of the topics covered in a unit about the gas laws. Most of these lessons were made possible by great teachers who shared their own resources. We need your help to keep the collection growing. Do you have a great demonstration, activity, or lesson related to this topic that you would like to share with the community? Please send it along for consideration.